Does your company brand suffer when you exhibit at congresses? What is the top reason your organisation exhibits at congresses and trade shows? 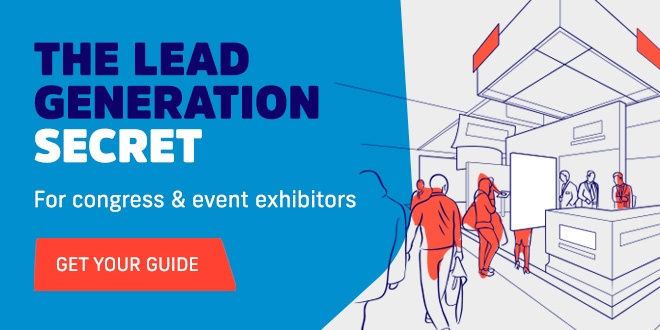 For most exhibitors, their goal is to generate lots of new business leads, by getting their company in front of large numbers of potential customers at the same time. While your main goal may be generating hot sales opportunities, your physical presence at the event will be a complex branding exercise. But are you creating the right impression when you exhibit at congresses? Exhibiting at congresses, trade shows and other events is a big investment. When it comes to your marketing budget, exhibiting at events represents a big spend, so it’s crucial that you make the most of your time at the show. When you’ve got a congress coming up, I expect your team spends hours and hours planning for the event, to ensure your booth stands out from your competition, and creates a memorable first impression. You probably spend time perfecting your stand design, organising product demos, and scheduling meetings with potential buyers. The best exhibitors always have lots of team members on their stand, with different areas of expertise – so there’s always someone on hand to answer technical or unexpected questions from congress attendees. Events like congresses and trade shows are your best chance to speak with large numbers of potential customers, face-to-face. This takes your organisation from a faceless company whose name someone may vaguely recognise, to a company they’ve connected with in real life. In the best way, congresses humanise your organisation, and help you connect with real, interested prospects. Many organisations fall into the trap of thinking that the end of the congress is the end of all their hard work. But really, it’s just the beginning. Attendees at a congress will most likely have spoken with dozens of exhibitors in the space of a couple of hours – yourself included. So while your booth team may have had a long conversation and made a great first impression, chances are this will have blurred in with all the other companies they spoke with during the event. Your event follow-up is your second chance to make a first impression. Will you wow potential customers with a timely, helpful and engaging message, or do exactly what all your competitors are doing and just send a generic follow-up email? Unfortunately, for most exhibitors the answer is the latter. Many exhibitors aren’t able to follow-up with leads from congresses for days – possibly even weeks. This is because they have to wait for employees to transcribe their forms or business cards from the event, or for the event organisers to send over the contact data from the badge scanners they hired. While you may have had a great conversation at the show, your follow-up doesn’t reflect that. How does that look to your potential customers? Many exhibitors take so long to follow-up after a congress that they’re all but forgotten by their contact. The reason for this? Their lead capture process. Most organisations don’t have the tools or technology in place to collect leads at a congress and then follow-up within a day or two. Traditional lead capture tools are slow, manual – often paper-based. To speed things up, and start your relationship with potential customers in a positive, engaging manner, the answer is digital. Changing your event lead capture process can make all the difference, streamlining your lead capture and follow-up process and removing the unnecessary delays that kill any interest a prospect has in your organisation.